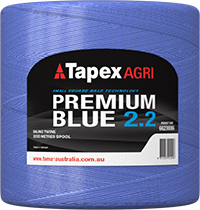 A brilliant bright blue, high quality twine for small square balers. Designed in Australia for no-nonsense trouble free baling. * Based on 3’x15’’x18’’ bales size and 2 strings.